The Cherry Hill School Board meets February 27 after two days of protests by hundreds of Cherry Hill High School East students sparked by the suspension of popular history teacher Tim Locke, who made comments regarding security issues at the school following the Parkland, Florida high school massacre. The meaning of "conversation" in America has migrated from the personal to the political, from signifying a private exchange between individuals to describing a public discourse among groups. But as controversy over one teacher's remarks about what he described as lax security continues to rock Cherry Hill East, the township school district seems to have redefined "conversation" again to mean a one-way channel enabling officials to listen to but answer few (if any) questions. And to say nearly nothing. It's as if the district were guarding some awful secret, rather than, say, overreacting — or perhaps overzealously guarding its image. On Friday, Cherry Hill did announce a welcome expansion of the police presence inside and outside all 19 of the district's schools, as well as ID requirements for students, parents, and others seeking to enter school buildings. The new rules go into effect Monday. 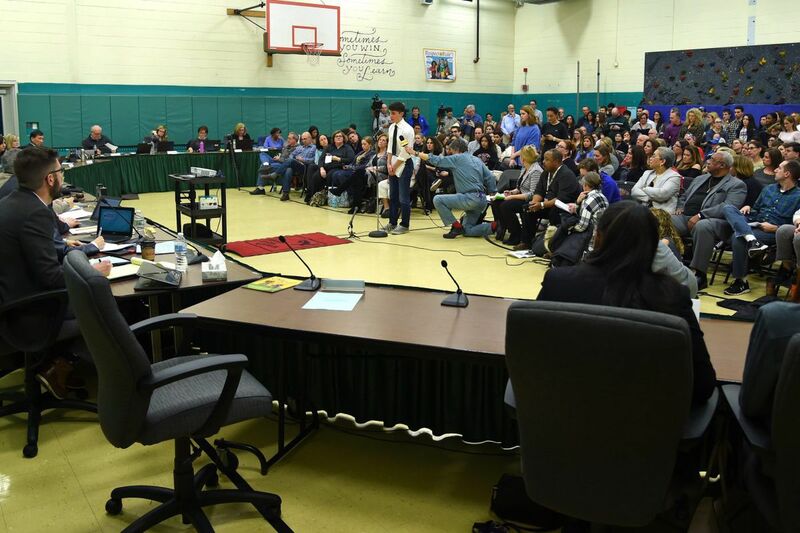 The district's announcement and a township statement supporting the enhanced procedures followed Superintendent Joseph Meloche's two-hour meeting with Cherry Hill Mayor Chuck Cahn and township Police Chief William P. Monaghan on Friday morning. The meeting was arranged after the Valentine's Day massacre at a Parkland, Fla., high school but before the uproar at East. Township officials said "fully equipped" (meaning armed) officers will increase their visits to and patrols of all district schools. But the new procedures do not in themselves provide for arming the police officers already employed by the district, such as the two each at Cherry Hill East and West. Monaghan has recommended that the school board allow for arming the four officers, a move Cahn also supports. "Why not do that?" the mayor said Friday. Meloche is not giving interviews. But the district's closed-mouth strategy has hardly prevented — and, in my view, has probably helped foment — waves of unflattering headlines about walkouts and protests by hundreds of students. And the absence of an actual two-way conversation between the district, the students, and the general public leaves plenty of space open for unhelpful rumors. The abrupt suspension of Cherry Hill East history teacher Timothy Locke roiled teens who were already uneasy, like their peers elsewhere, due to the events in Florida — as well as subsequent, less serious, but still concerning, threats and arrests at other high schools in New Jersey. Neither of Friday's announcements mentioned the suspension of the popular teacher, whose storytelling flair and caring persona have endeared him to students for 17 years. Locke was made to leave work after making remarks about East campus security to two dozen students in his World History class last month. While the content, nuances, and implications of what the teacher said are in dispute, by all accounts Locke's words were dramatic — perhaps self-dramatizing — and in keeping with his propensity to use personal information and anecdotes as teaching tools. Students have cited his previous references to growing up in York, Pa., serving in the military, coping with PTSD, and recovering from substance abuse as disclosures that inspired lively classroom discussion. Last Thursday, the website NJPen.com quoted, but withheld the name of, a student who described Locke as indicating he possessed a firearm and writing "I have the gun" on the classroom whiteboard on Feb. 22. But two students who also were present — Jake Ober and Timothy Welsch, both 18-year-old seniors — told me they neither heard nor witnessed such statements and actions by a teacher whom both deeply admire. "This has really been blown out of proportion," Ober said. "I just want to make it known that suspending Mr. Locke is a complete mistake," said Welsch, adding that a classmate upset by the frank talk that morning was escorted by a fellow student to the school nurse's office. The teacher was sent home, spoke briefly to my colleague Jason Nark, and later refused to make any further comment. The district's apparent vow of silence had begun. But Friday's announcement did say that public comment will be taken at a special board meeting set for 7 p.m. Tuesday at Cherry Hill West. So let's hope district and school board officials don't airily dismiss questions as mere "conjecture," as was done at last week's regular school board meeting. A similarly dismissive atmosphere prevailed last Monday at an informal session involving Meloche, parents, and students that was scheduled prior to the Locke controversy. The superintendent at first seemed "diplomatic" but became "defensive," said East parent Eric Ascalon, who was in attendance. "It was a form of stonewalling, of giving the appearance of providing information when in fact they're providing nothing," Ascalon said. "It was like, 'Don't worry, we've got this. We've got the situation under control.' "
Meanwhile, opaque (I'm being charitable) official dispatches separately posted early last week by Meloche and East principal Dennis Perry seem so over-lawyered (our tax dollars at work!) they lack not only information, but meaning. As one East teacher, who requested anonymity, observed: "The school district teaches freedom of thought. But their own people are not allowed to speak." That doesn't make for much of a conversation. By any definition.